Back2Life is a handy undelete and recovery tool for Windows. It was designed to be both easy in use and efficient in data recovery. 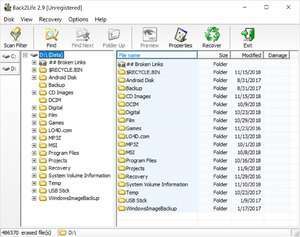 Looking similar to Windows Explorer, it provides access to lost files and folders that got beyond the reach of the Recycle Bin because of accidental erasure, virus attack, disk corruption or reformat. Supported file systems are FAT, NTFS and CDFS. Back2Life 2.9 is a shareware program and can be used as a demo to try the software until the free trial period has ended. A full version of the program is available after the trial period ends. For security reasons, you should also check out the Back2Life download at LO4D.com which includes virus and malware tests. Additional screenshots of this application download may be available, too. Back2Life has a presence on social networks.